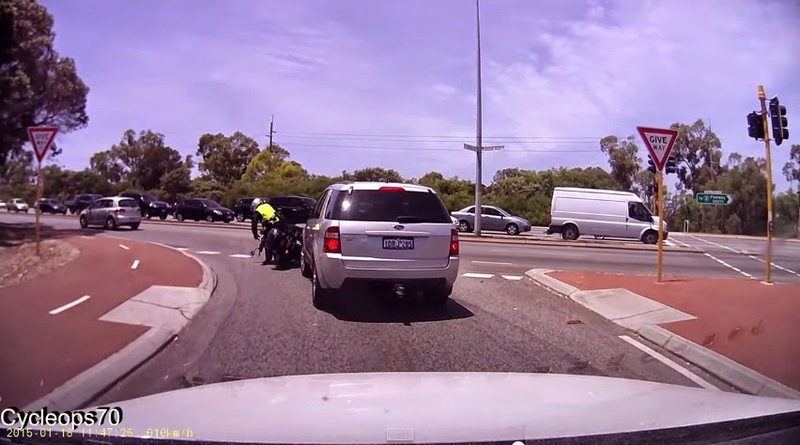 Here's one from the Instant Karma file: video of an impatient and inattentive driver rear ending a motorcyclist... who just happens to be a police officer. The video comes from Perth, Australia, and features dashboard footage of a police officer on an unmarked motorcycle. However, the police officer himself is highly visible and in uniform -- a fact that is quickly noted by the owner of the dashboard cam. It's a fact that somehow escapes the driver of another car, though, who speeds aggressively into the police officer's lane, tailgates him, then bumps into him at an intersection. If you've ever been the victim of such an aggressive driver, you'll watch this video with glee because it's clear from the officer's body language that this driver isn't going to be let off with just a stern talking to. Credit is due to the Australian police officer, however. His immediate reaction upon being knocked off his bike is very similar to what anyone of us would feel. But in less than a second, he regains his professional composure. Our favorite part comes right toward the end of the video, when the officer swaggers up to the car's window and shifts his weight into a stance that clearly says: "I am going to make you regret what you've just done, and I am going to enjoy every second of it." We're enjoying it, too, officer.